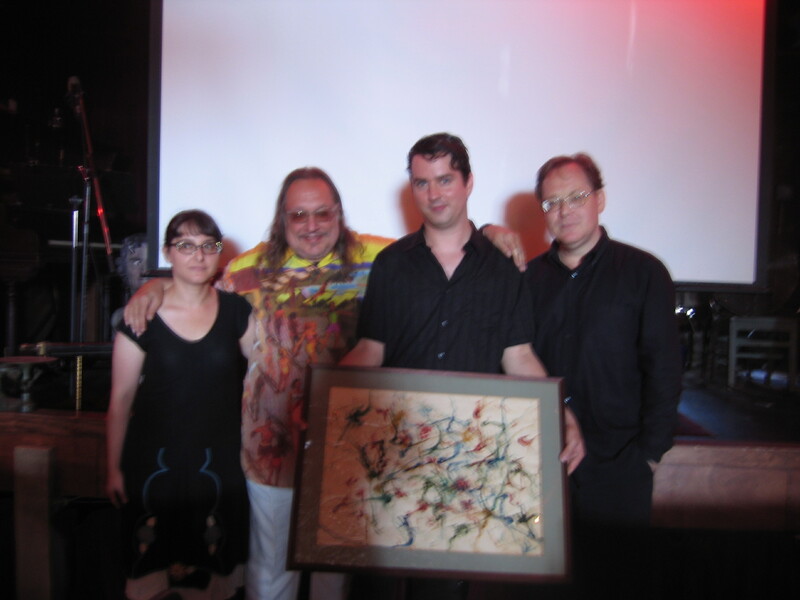 On Sunday July 11, 2010 at 3:00 p.m. at the Jalopy Theater, 315 Columbia Street in Brooklyn, Doug Skinner and the Ullage Group organized an afternoon commemorating the life of John A. Keel. The afternoon included readings from some of Keel’s lesser known works read by Mr. Skinner, Lisa Hirshfield, Larry “Ratso” Sloman and Anthony Matt. I had read with rapt interest Keel’s most famous work, The Mothman Prophesies, some years ago and I’d also seen the movie of the same name loosely based upon the book. When I read the book I remember thinking how some of the more random paranormal events (not related directly to the Mothman story itself and not depicted in the film) mirrored some odd events in my life. I knew that Keel lived in New York City and I was peripherally acquainted with a large number of people who knew or had met Keel. I’d expressed interest to some of them in meeting him, but alas, that was not to be. The presentation began with Doug Skinner toasting the memory of John A. Keel by drinking a can of Glucerna (a nutritional drink for diabetics). I learned that Keel’s given name was Alva John Kiehle. Lisa Hirshfield then read his first published work from 1945 when he was 15 years old. His wry sense of humor was evident even then. During his stint in the military in the early 1950s Keel worked for the armed forces network out of Cairo, Egypt. The audience was treated to an audio clip of his presentation from inside the Giza pyramid, followed shortly by a kitschy song named “Jadoo” promoting his book (of the same title) of adventures in the Middle East and Africa. I am a proud owner of the book Jadoo! We saw a remarkable movie he made in New York City in the 1960s called “On Exhibition”. In it Keel played a drunk at the Museum of Modern Art. Keel wrote sleaze novels under the pseudonym Harry Gibbs. Some excerpts from these were read by Larry “Ratso” Sloman, Keel’s friend, sometimes employer, and editor of High Times Magazine. Soon after we saw the worm painting pictured above painted by 35 earthworms in October 1960 for Merv Griffin’s TV show “Play Your Hunch”, for which Keel was a writer. Later in the 1960s Keel pitched a film treatment called ” Nudists From Outer Space” read by Anthony Matt. Finally a video clip from John Keel’s appearance on the David Letterman Show in the 1980s was played. He discussed a variety of paranormal phenomena. I really enjoyed this look into John A. Keel’s life, although I had expected more time to be devoted to the paranormal. I was pleased to meet some other anomalists after the performance including Geoff who is working on a fascinating movie about UFOs filmed over New York City called “Believing Is Seeing“.